Regardless of your problem, be it Rats, Moles, Bed Bugs or Wasps, our team are here to listen to and offer free advice over the phone. If you still require our services then it’s our aim to be with you with 90 minutes after we have spoken with you. 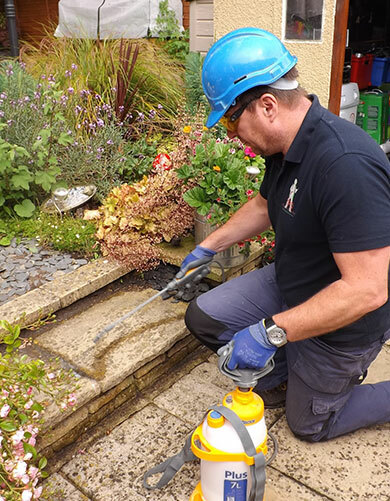 Once we arrive, we will ensure that all precautions are taken to keep any pets or small children away from any pesticides that may be used to tackle your problem by conducting a site survey. We only use Unmarked Vans when we pay you a visit, which will ensure customer confidentiality and keep your neighbours in the dark. We are fully insured and all our staff are fully qualified and are CRB cleared to give you peace of mind. Contact a member of our team on 0800 1455762 to discuss our range of residential pest control services, we aim to be at your property within 90 minutes of your call!